Hiring a babysitter is a welcome break for parents and a great way for young people to make a little spending money – especially if they enjoy caring for children. What do you do when you need a babysitter and your family is busy and your best friend has plans? Plan ahead for that time and begin your search early. After you’ve found a prospective babysitter, have them watch your children for an hour. This will give you an idea of how well they get along and you’ll be more likely to enjoy a relaxed time away from the children. Plan ahead for the inevitable time that family and friends are not available to baby-sit. This allows you time to be selective. Network. Let your friends, family and neighbors know that you are looking for a babysitter. Meet the candidates in person. This will allow you the opportunity to see how they interact with your children. Look for someone who has experience and references and/or has taken a reputable babysitting course. It’s important that you clearly communicate your expectations. Ensure that your children understand that in your absence, the babysitter is in charge. Write down and review ground rules with both the babysitter and your kids prior to leaving. Make sure you explain clearly any rules that you have for your sitter. For example whether or not guests or personal calls are allowed and what parts of the house are off limits to them and the kids, etc. Once you have found a great sitter, make sure they how much you appreciate them. Feed your children before the sitter arrives or have food that requires little or no preparation or have take out delivered. Make sure you have snack food on hand for the children as well as your sitter. Don’t be late. If you are delayed, call. You sitter will worry if you are late and so will their parents. When you get home ask how things went. Were there any concerns or problems? Former Police Chief Jack Beaton, suggests to keep your children and the sitter safe, you provide the babysitter with the following information. The location of the smoke detectors and flashlight. The cross street or description of your house location as well as the address. Red Cross has a handy downloadable Babysitter’s Checklist with important information about your children, emergency contact and home safety information. As parents, we know the basic safety tips and crime prevention strategies, but we can always use a refresher. 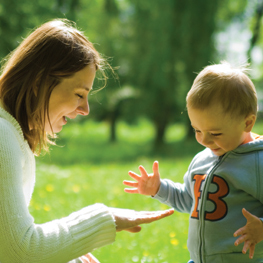 The City of Calgary, St. John Ambulance, the Red Cross, and the YMCA provide babysitting-training courses that also offer valuable information to parents. Siblings As Babysitters – Is Your Older Child Ready? This entry was posted in Uncategorized and tagged babysitter, babysitting on January 28, 2015 by Calgary's Child. Life is busy, so busy that sometimes it can feel like all we have time to do is rush from school to practice and from games to bedtime! While we are together in the car racing from errand to event or cheering from the stands, we aren’t really connecting with our families. So each year we resolve to change that. This is the year we say firmly to ourselves, we’ll find some balance and harmony in our lives and along the way, we’ll make a difference in the lives of others. Volunteering as a family is an excellent way to do both. Volunteering also gives adults and children a shared sense of purpose, builds confidence and teaches new skills. And volunteering is easy. Whenever and how often is up to you … as often as once a week, once a month or even once a year. The choice is yours. And the best part is that everyone in the family can participate. There are many local organizations that offer a range of opportunities for your family to volunteer together. Propellus, formerly Volunteer Calgary, Role Mother’s and United Way all have unique ways to make it easy for everyone to join in. Enhances development — Volunteering can benefit a child’s psychological, social and intellectual development. Volunteering increases self-esteem, responsibility and an interest in learning and helps children develop new social skills. It also provides opportunities to apply newly learned material. Promotes a healthy lifestyle and choices — Children who volunteer are less likely to become involved in at-risk behaviors. Teaches social responsibility — Volunteering helps children develop empathy and learn that one person can make a difference. Creates a lifelong ethic of service — Individuals who volunteer as a child or who observed their parents volunteering have a much higher probability of being a volunteer in their adult years. Improves the community — Volunteer activities are essential for advancing the common good, and children can be part of the change. As a family, how would you like to make a difference? Realistically, how much time can you commit? To create your own opportunities, how will you begin? Who will make the contact on behalf of the family? This entry was posted in Uncategorized on January 18, 2015 by Calgary's Child. As parents most of us have the right intentions, but in the hustle and bustle of daily life, it’s difficult to parent positively. As a result, a lot of our interactions with our kids are reactive. According to Marianna S. Klebanov, JD, it’s important to become more aware of our parenting behaviors. Stop spanking. Many of us grew up being spanked, and it’s an easy response when a child is misbehaving. “While spanking can get the desired results in the short term, the truth is, there are no long-term benefits, and it can lead to quite a few issues down the road, including adversely impacting cognitive development and behavior,” Klebanov comments. Model kindness and compassion. We all say we want to raise kids who are kind and compassionate—but be honest: How often do you demonstrate those values in action? “Kids notice things like whether you’re nice or rude to the cashier, whether you help or ignore others who are less fortunate, and how you respond when someone makes a mistake,” Klebanov notes. “The values that stick will be the ones you live, not the ones you preach about. Criticize less. Parental criticism comes from a good place. We want our children to learn, improve, develop good habits, avoid mistakes, and generally be the best they can be. But we don’t always stop to consider the impact our criticism has on their self-image and confidence. “This year, strive to be more sensitive of what you’re criticizing, how often you’re criticizing, and whether or not it’s constructive or destructive,” Klebanov advises. Hug and kiss more. When parents are affectionate and loving, it positively affects children’s mental health, as well as their social and emotional development. “So hug and kiss your children as much as possible, as long as they’ll let you,” comments Klebanov. Give them the responsibilities and freedoms they’ve earned. You may want your kids to stay little forever, but they’re growing physically, emotionally, and psychologically every day. Even if it’s bittersweet for you, give them privileges and responsibilities that are appropriate for their ages and maturity levels. To improve behavior, use rewards more and punishments less. Rewards create positive connections in a child’s mind because they link good behavior with happiness, unlike punishment-based discipline, which instead trains them to behave out of fear. “Remember that parental praise is an important reward, too,” Klebanov says. Think about my own childhood more. Take a mental journey back in time. What was happening during your childhood when you were the age your child is now? Are you acting or sounding just like your parent in a way you aren’t proud of? Are proud of? Are you projecting your childhood experiences onto your own child? “Address your own childhood problems and traumas in therapy,” Klebanov instructs. This entry was posted in Uncategorized on January 13, 2015 by Calgary's Child. Our readers often ask us for advice about birthday parties, and specifically, what kind of parties we throw for our own children. After much debate, we’ve come up with a list of ‘Our Favorite Birthday Parties’. This was no easy task. The parties on this list were chosen because they’re tried and true (we’ve given them for our own children), they are simple, relatively stress-free…and our kids loved them. Mark this birthday with the closeness of immediate family and friends. Have each guest bring an item to include in a time capsule to commemorate this first year. You can include anything that was special to your child and/or a significant memento of this first year. Perhaps your baby’s first soother, a tape of a special show, ticket stubs from events or concerts, a Sears catalogue, sports magazine or maybe even a bottle of champagne. Seal well and store everything in a safe place until your child’s eighteenth birthday. Keep it simple. Toddlers can be stressed out easily by too much commotion. We know this to be true, we’ve had more than one child break into tears during these parties. Our best parties for this age have been home based – a few little friends, family, cake and presents – very simple! Now, the real party planning can begin, but be advised, don’t go overboard! If you set the bar too high on this party, you’ll be trying to outdo yourself for years to come. Keep it simple and remember the purpose is fun and celebration. Party at the Playground: Simply find a new and exciting playground, set up a picnic and let the children play and have fun. You can set up some formal games (duck, duck, goose or sack races), or bring in a Piñata to hang from a tree. This picnic is wonderfully stress-free. (Hint, if the weather is poor, move the picnic indoors and set up blanket tents in your home. McDonalds: for the ultimate stress-free party, head to a McDonald’s ballroom. We loved this party for four-year-olds, and the kids had a ball (pardon the pun). Let their imaginations soar. Theme parties are a huge hit with this age group. Collectively, we’ve held Pirate and Princess parties, Barbie parties, Firemen parties, Gardening parties, Bug parties and more! (Check out our article ‘From A to Z: 26 Themes for Your Child’s Next Birthday’) for great theme ideas). Our favorite theme party is a Backwards Party. This party always gets great giggles. Print the invitations backwards so when you hold it up to a mirror, it can be read, (it’s simple to do on the computer). Encourage the guests to wear their clothes backwards; have cake first, food next, then presents and games, you get the idea. For added fun, everything everyone says means the opposite (for instance if the cake is truly awesome, this kids will ‘say’ they don’t like it). A sure fire hit. This is a great time to check out an outside venue. Calgary has dozens of great places to take your kids and their friends to party – from science to gymnastics; swimming to the theatre, there’s something for everyone. One of our favorite venues is the Inglewood Bird Sanctuary. A professional naturalist presents an entertaining and educational nature-based program complete with hike. There’s a nature craft and party room and goodie bags filled with neat nature ‘things’. It’s a great party and very inexpensive, especially if you had trouble paring down the guest list. Last year our readers voted the Calgary Zoo for the best birthday party venue in our 2014 Parents’ Choice Awards. They loved the fun of a themed party in their child’s favourite part of the zoo. Parties include a mini tour, fun, games and snacks and a gift! The zoo provides staff to thrill and “edu-tain” all of your guests. Homorable mentions in this category went to the Calgary Gymnastics Centre and Stir Crazy Family Fun Centre. You might want to give these a try, our readers are never wrong! If you love home parties, this age is a great time to add an entertainer. We’ve had magical parties and dazzling parties with magicians and scientists. We’ve sprinkled Fairy dust and had menacing pirates and we’ve had animal visits. Our readers picked Butterfield Acres Farm, Mad Science and Christopher Cool Productions for their 2014 Parents’ Choice Award favorites. Finally, the guest lists start to become somewhat manageable at this age. It’s time to venture into the land of the sleepover party. There are no hard and fast rules here, our only word of advice is to make pickup time no later that 10 am. (just trust us on this one). With smaller guest lists, it’s also a great time to take the kids to a movie, go bowling, play laser tag, miniature golfing, or swimming – the list is endless. How about a trip to a farm or corn maze? Check out Kayben Farms, Calgary Corn Maze & Fun Farm and Cobb’s Corn Maze. If it’s activity-based, this age group will love it. And that’s our list of tried and true. 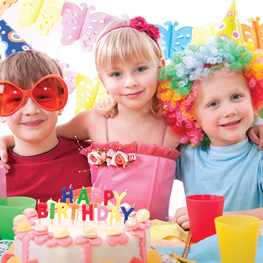 For a complete list of more great ideas for birthdays including venues, entertainment and suppliers, visit www.calgaryschild.com (Resources > Birthday Party Guide) and (Family Fun > Parties). Planning a winter birthday party? We can help with that too! Our 2015 Jan/Feb issue features our Winter/Spring Birthday Party Guide and cool ideas for the perfect winter party.